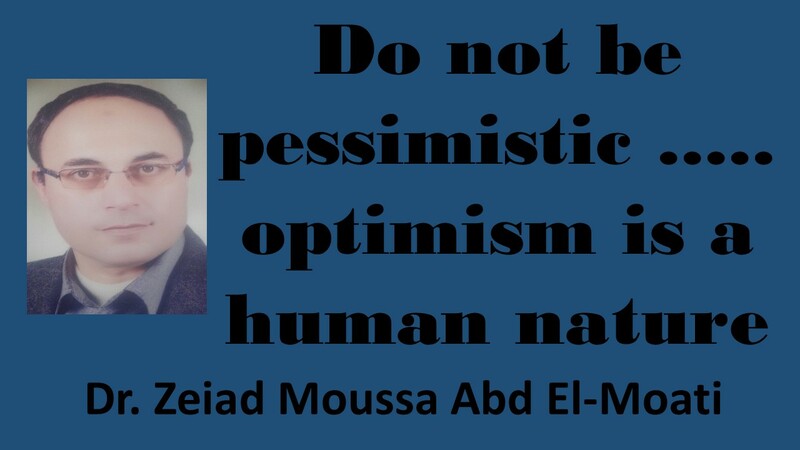 Optimism is a human nature. Any person is born optimistically by nature. 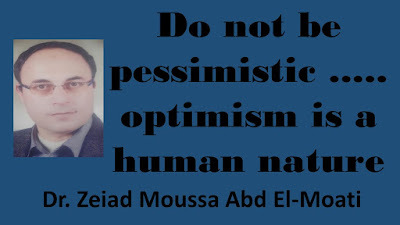 Any person exercises optimism in his daily life and optimism is called for by Islam. We take examples of practicing optimism in everyday life. If we assume that a person is pessimistic, he wakes up in the morning and thinks about getting out of the house. When he leaves the house and descends the stairs, he may fall from the stairs, breaking his hand or his foot. If he survives, he may be hit by a car. On his way to work, a car accident may occur, causing him disability or death. If he survives, his money may be stolen while crossing the road in front of his workplace. If he survives, he may have a heart attack and he will die. If a person surrendered to those fears, he did not leave his house. But all human beings are optimistic and live a normal daily life. Even if any person put the negative concerns and pessimism in his lives, he will sit waiting for death or commit suicide from a lot of pessimism. For example, when someone eats, the foods may be contaminated with dangerous and pathogenic microbes, leading to death, or leading to serious disease, and may be contaminated with pesticides caused Serious and deadly diseases, why eat? The hunger is the best!!! When someone drinks water, the water may be polluted, causing disease and death!!!! The thirst is the best!!! If the student thought to study hard, he may forget what he understood and saved in the exam, or perhaps an incident happened to him and he cannot attend the exams, so why he studies hard!!! Even if he succeeds and graduated, he may not find a job!!! Thus, if someone succumbed to pessimism, he would find life black and gloomy, and he found it useless to be alive. He would wait for death and perhaps commit suicide to rid himself of these fears. It is God's favor to us that we have been created with optimism, and optimism from the nature of human beings. We eat, drink, work, find and strive for a better future, remove these pessimistic fears from our minds, and we are optimists where optimism fill us with a sense of a better future. Optimism does not mean just sufficiency with dreams without seeking to achieve what we aspire to, but must diligence and work to achieve what we aspire to. The demands did not take by wishful thinking ... But the dreams will be achieved taken by hard work. Optimism or pessimism about certain things, numbers or days is not logical. This is one of the things that Islam has forbidden, and it is one of the practices of ignorance. The Arabs in pre-Islamic ignorance called it a birding, and the word “birding” is derived from the habit of the people in the ignorance time. If a person wants to do anything, he went out to the bird's use. If he saw that the bird flew to the right, it seems to look good and work on. If the bird flew to the left, he will be a pessimist and retreat from work. The Messenger of Allah (peace and blessings of Allah be upon him) forbade the birding or pessimism. Anas (may Allah be pleased with him) said: The Messenger of Allah (peace and blessings of Allah be upon him) said: “There is no infection and no birding, and I like the omen said: What is the omen said: a good word "(Agreed). We must work and strive and trust in God, and be optimistic, and let us know that nothing will happen to us except what God has written to us. " Say, "Never will we be struck except by what Allah has decreed for us; He is our protector." And upon Allah let the believers rely. "(At-Tawbah: 51). We must be optimistic. We must work and try to achieve dreams. We must be optimistic that the next better, and that the best has not come yet.